Playing now thru October 4: Blind Lemon Blues celebrates the legacy of Blind Lemon Jefferson and his profound influence upon the development of American popular music. 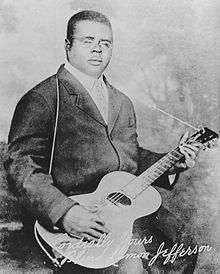 Jefferson was a blind street musician, who played his guitar at the corner of Elm Street and Central Avenue in Dallas, Texas, until a Paramount Records scout discovered him. Between 1926 and 1929, Jefferson made more than 80 records and became the biggest-selling country blues singer in America.